Combine any 2 classes for you or same class for You and a FRIEND! The Classroom has moved to my home studio and can accommodate 2 students per class. I am excited to change up the structure and information to meet the needs of floral artists of the future! What if you just interested in learning new things?? 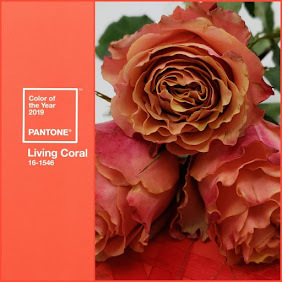 Great the new format will be a fantastic way to get some of the basics and understand how to approach the floral design trends surrounding us. All you have to do is pick a topic and begin! The 2017 Symposium "X" Recap Video is now Available on our YouTube Channel! Click the image below and relive your favorite moments today! AIFD members: Unsubscribing from AIFD emails means that you will not receive any email blasts regarding your membership, including membership dues invoices, CEU renewal notices, membership benefits, etc. Yep, you read that right: 5 million and counting! That's the social media impressions generated by YOU and YOUR Instagram & Twitter Posts in the past 30 days!! 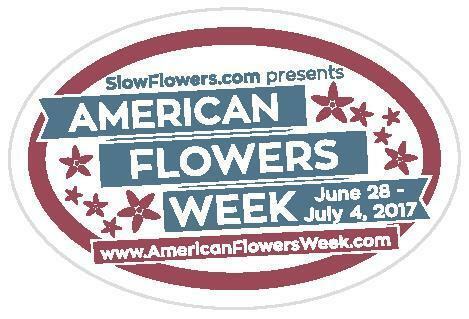 #AmericanFlowersWeek has exploded -- just like fireworks! The 3rd Annual American Flowers Week has come to a close and it was our best ever! 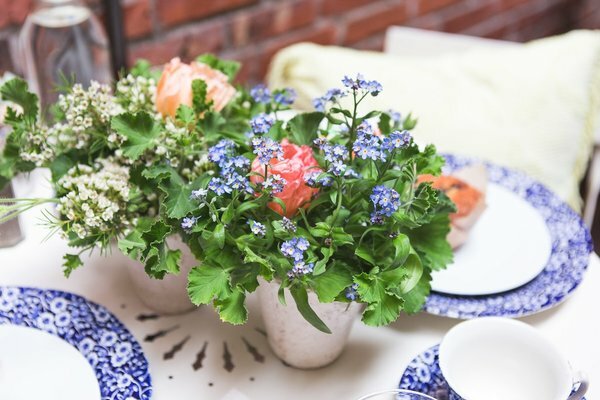 With participation across the U.S. in all sectors of the floral industry, this New Floral Holiday is waving the flag and making a splash from coast to coast. 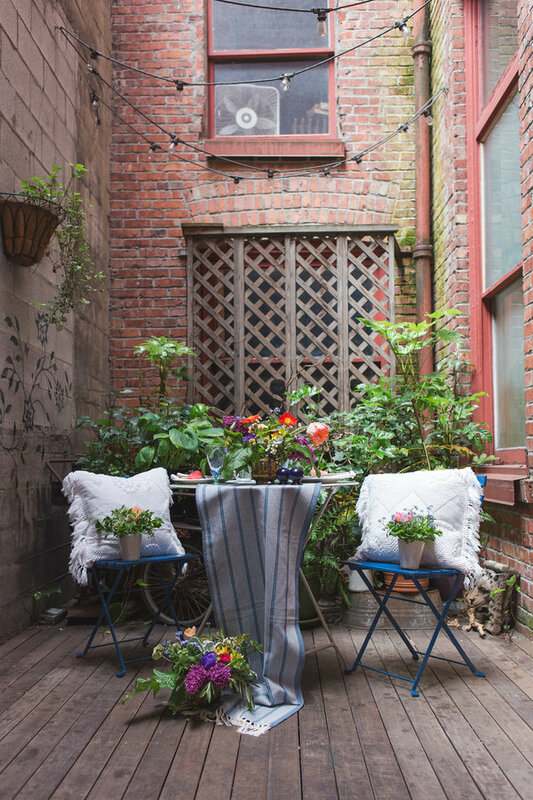 Read on to discover how the Slow Flowers Community spent this year's campaign celebrating American-grown flowers -- be inspired and start making plans for your 2018 floral parties, events and creative projects! Design credits for images shown above, clockwise from top left: Amy Kunkel-Patterson of Gather Design Co.; Riz Reyes of RHR Horticulture; Tara Folker of Splints and Daisies; and Teresa Sabankaya of Bonny Doon Garden Co.
floral-inspired fashion shoots depicting iconic American grown blooms. The designers who contributed their creativity and artistic talents teamed up with generous flower farms that donated stems straight from their fields and greenhouses. Four of the five looks are shown above. 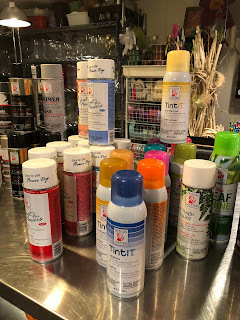 We're saving the final look to feature in an article that will appear in the August 2017 issue of Florists' Review -- so stay tuned for the big reveal! Our All-American floral looks would never have been possible without the support of Slow Flowers’ sponsors, including Certified American Grown, Arctic Alaska Peony Cooperative, Longfield Gardens, Syndicate Sales, Seattle Wholesale Growers Market, Johnny’s Selected Seeds and Association of Specialty Cut Flower Growers. 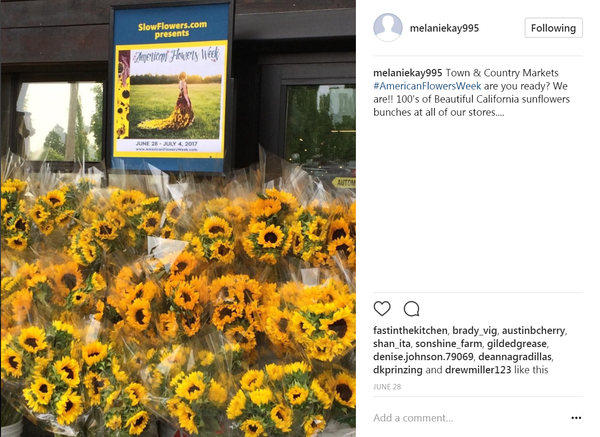 Melanie Cherry, Town & Country Markets' floral boss, shared this shot of an in-store sunflower display for American Flowers Week. 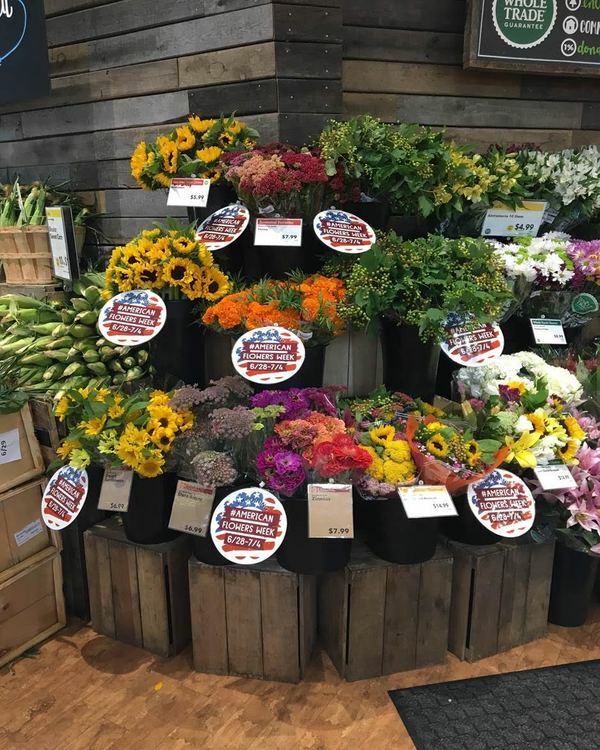 Diana Westcott, regional floral buyer for Whole Foods' Mid-Atlantic Region based in Maryland, shared this beautiful display from one of her floral departments! Slowflowers member Rita Anders of Weimar, Texas-based Cuts of Color, delivered hundreds of bouquets and bunches of American Flowers Week blooms to Central Market in Houston. She texted us these photos and added: "Labels look great! I love the labels!" On the first day of American Flowers Week, June 28th, I met up with Steve Pabody, partner in Triple Wren Farms with his wife Sarah Pabody. 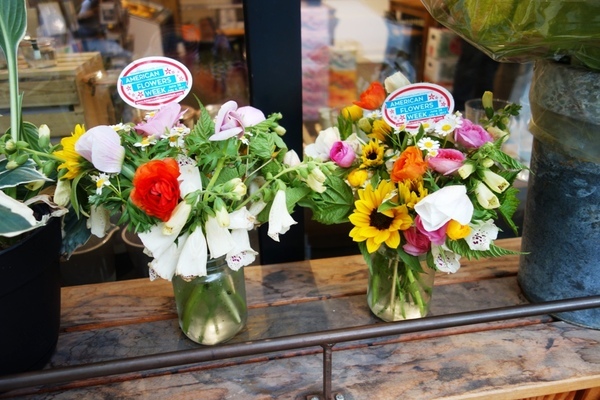 Their Ferndale, Wash., flower farm makes weekly deliveries to Cone & Steiner General, an innovative new-old neighborhood convenience store, with soon-to-be 3 locations. 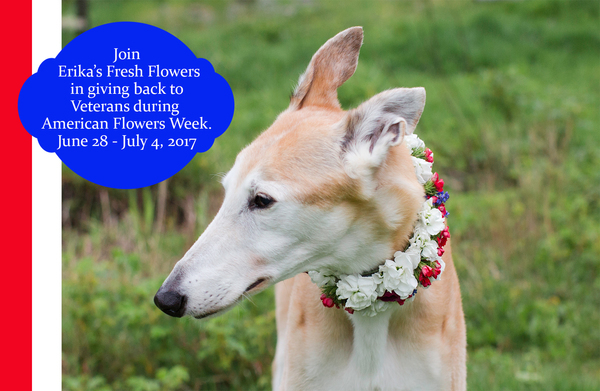 Steve was there to deliver bunches of lovely anemones and cheerful mixed floral bouquets in Mason jars -- all labeled American Flowers Week. I had a chance to ask retailer Dani Cone for her take on the holiday - and on why she buys from local flower farms. 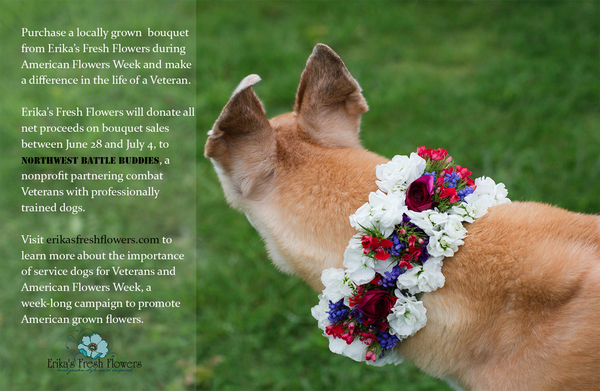 Kathleen Barber of Erika's Fresh Flowers in Astoria, Oregon, donated all net proceeds of her locally grown bouquets sold during American Flowers Week to Northwest Battle Buddies, a nonprofit partnering combat veterans with professionally trained dogs. 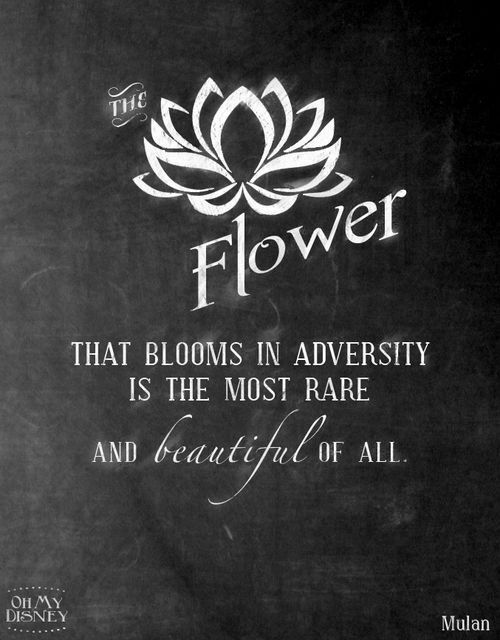 Love this idea and the personal, healing connections being made with Kathleen's flowers. 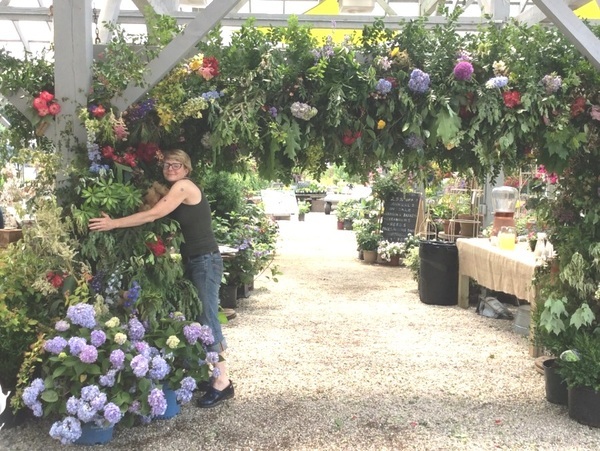 Rayne Grace Hoke of KittyWitch Botanicals, who manages Slow Flowers member O'Donal's Nursery's floral program, created an impressive and simply gorgeous installation to celebrate #americanflowersweek. The folks at O'Donal's, based in Gorham, Maine, turned the event into a week-long draw for customer involvement and education. Love love love our #floral #installation created with #flowers and #blooms right from @Odonalsnursery in celebration of #americanflowersweek. Working with @myslowflowers to educate how important it is to know where your flowers are grown!!! Tammy Myers of First & Bloom, based in the Seattle area, designed an Americana-themed styled shoot with a local home-goods retailer that repurposes vintage army tents and camouflage into pillows and cushions. 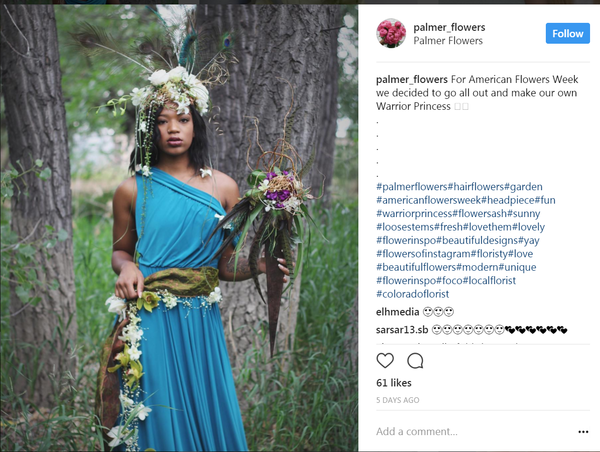 Palmer Flowers, based in Ft. Collins, Colorado, and other locations, posted this alluring styled shoot: "For American Flowers Week, we decided to go all out and make our own Warrior Princess." 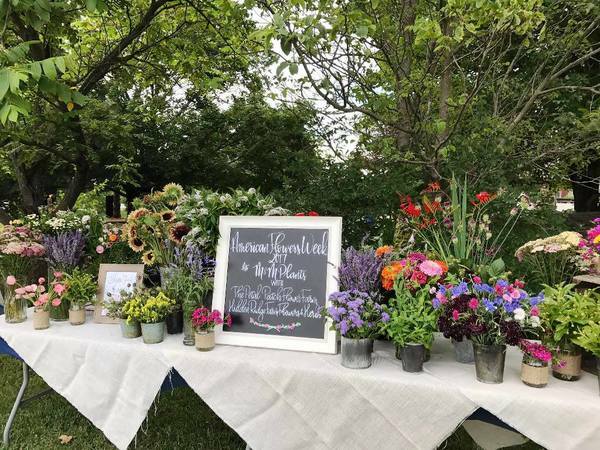 A brand NEW regional flower farming group called Lowcountry Flower Growers (based in and around Charleston, S.C.), held their inaugural event to celebrate American Flowers Week. Thanks to Jim Martin of Compost in my Shoe for sharing this pic from their July 1st public Floral Event! 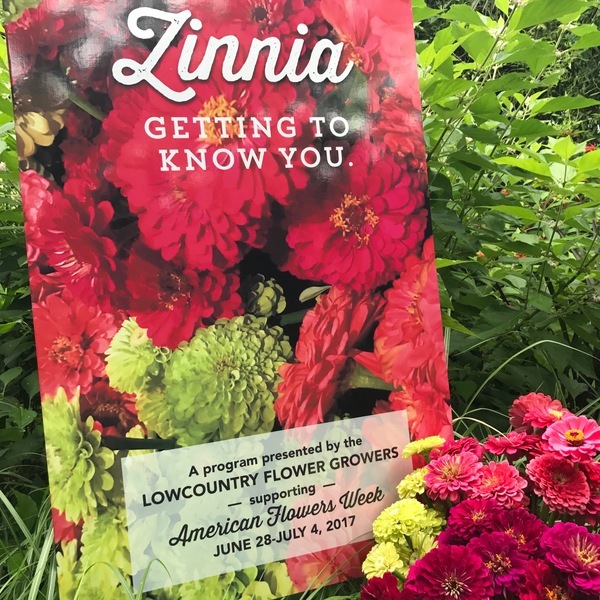 Lowcountry Flower Growers presented a program on innovative, creative and beautiful ways to use the Zinnia, held at the Marion Square Park Farmers Market in Charleston. 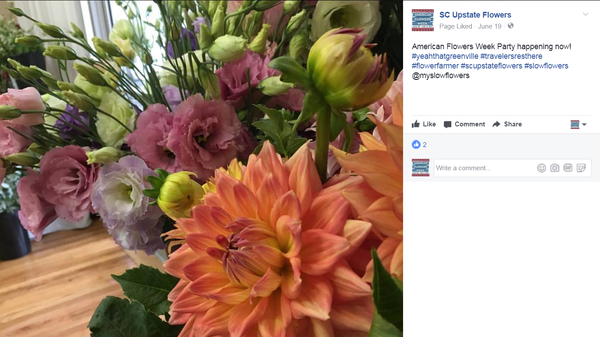 Since we launched American Flowers Week, flower farmers have jumped onboard, using AFW tie-ins for local promotions, such as in South Carolina where last year SC Upstate Flowers made a big splash by throwing an AFW farmer-florist party. 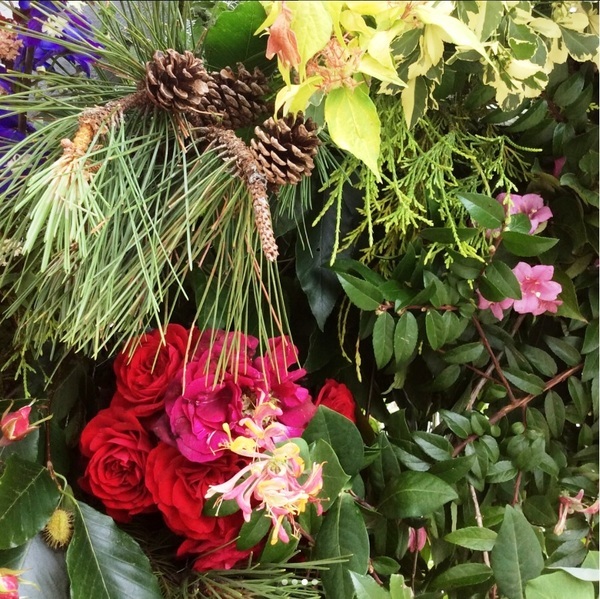 The goal?To introduce themselves and their beautiful, local blooms to area floral designers. Melissa Smith of Fraylick Farm in Travelers Rest, S.C., came up with the idea after reading about AFW 2016 in the Slowflowers.com newsletter. 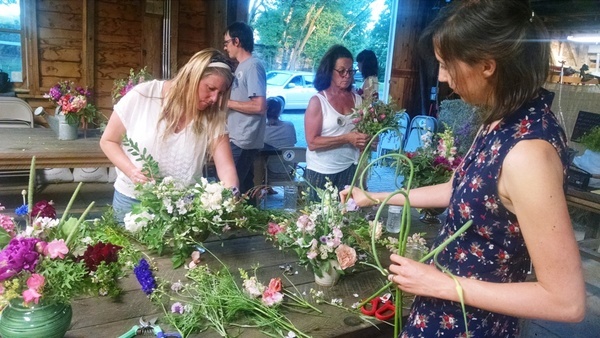 encouraged local florists to “spend an evening with their peers and enjoy flower fun without the pressure of arranging for clients,” Melissa says. 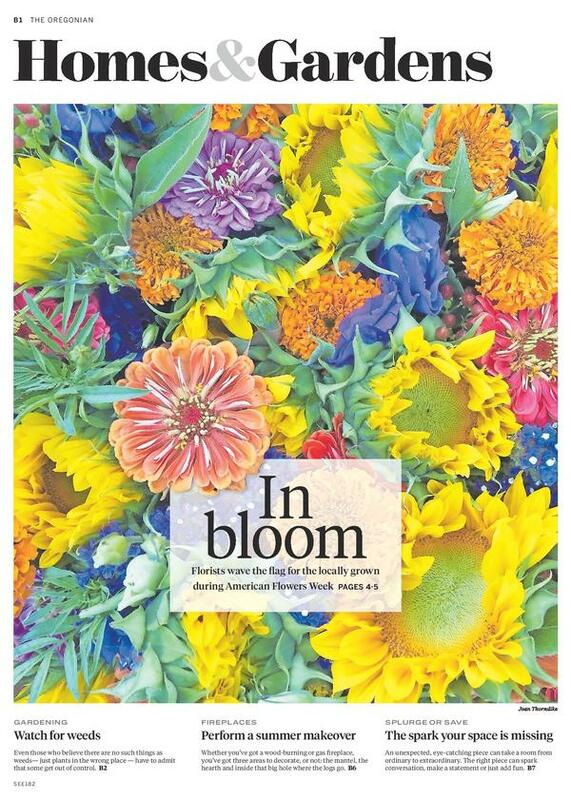 Last year, Marybeth Wehrung of Stars of the Meadow farm in New York’s Hudson Valley used American Flowers Week stickers on her mixed bouquets sold through two local natural grocery stores last year. 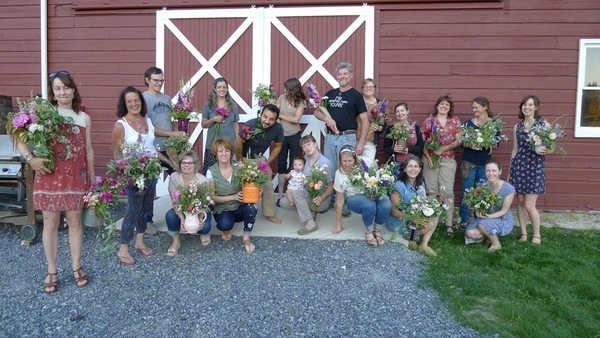 This year, along with other members of the Hudson Valley Flower Growers Network, they staged an "Arranging Soiree" of their own at Porco Homestead Farms in New Paltz, N.Y. Check out the group photos above! 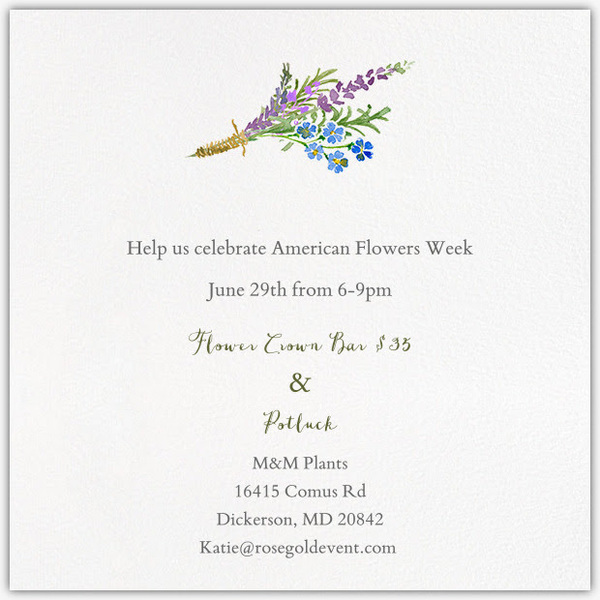 Slow Flowers member Kelly Shore of Petals by the Shore teamed up with Katie MacGregor of Rose Gold Events & Stylingto host an #americanflowersweek FLOWER CROWN WORKSHOP and Potluck at new Slow Flowers member farm, M&M Plants in Dickerson, Maryland. Guests designed with M&M Plants blooms, as well as flowers from The Petal Patch Flower Farm and Hidden Ridge Farm, Flowers & Herbs for beautiful results! 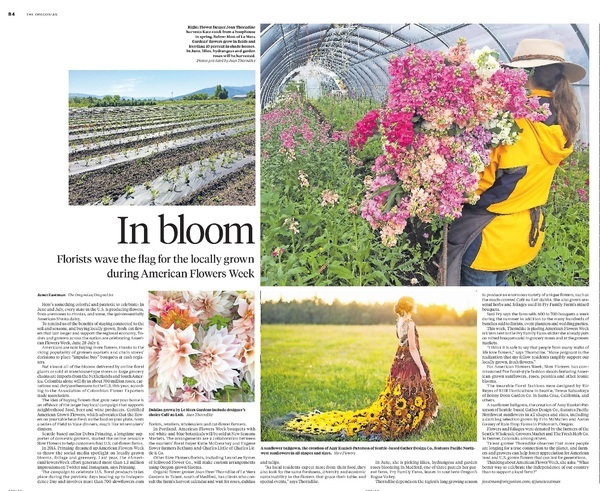 "America's diversity found in its flowers: Florists wave the flag for locally grown"
Here's something colorful and patriotic to celebrate: In June and July, every state in the U.S. is producing flowers, from anemones to zinnias, and some, the quintessentially American Shasta Daisy. 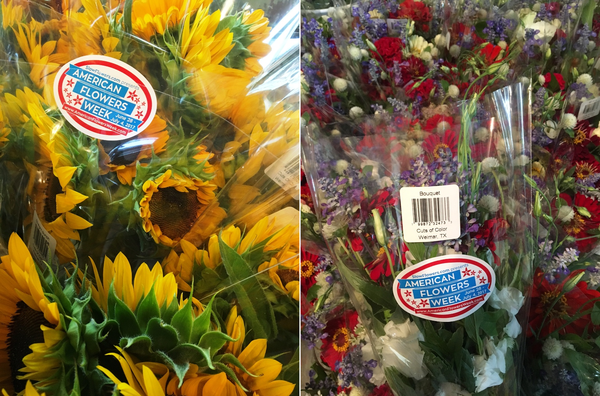 To remind us of the benefits of staying connected to the soil and seasons, and buying locally grown, fresh-cut flowers that last longer and support the regional economy, florists and growers across the nation will be participating in American Flowers Week, June 28-July 4. You can download a free USA State Flower Map and a page to color each state flower, including the Oregon grape. And you can ask flower sellers where their stems came from. 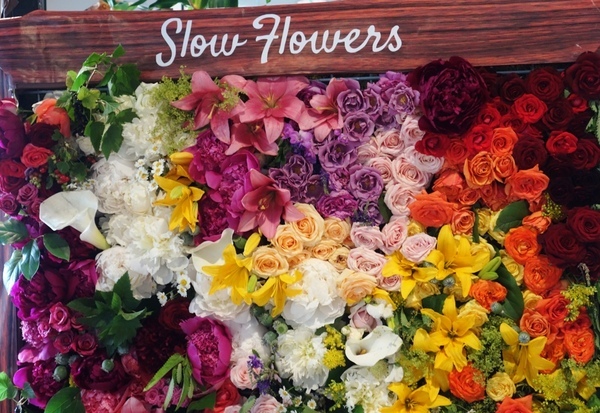 Type #AmericanFlowersWeek into your Instagram search and you'll be wowed by the beautiful flower fields, floral arrangements and faces from the Slow Flowers Community that pop up. 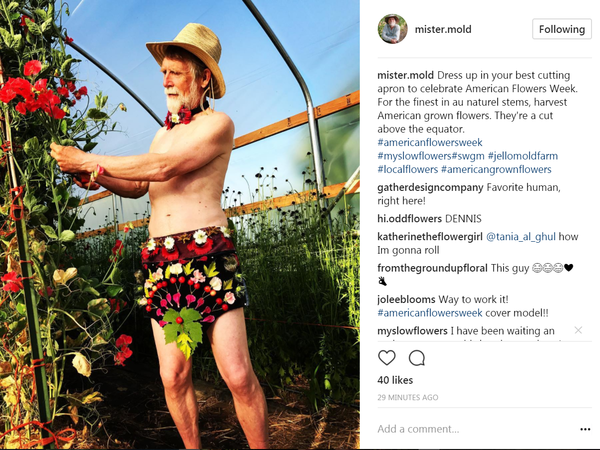 One of our favorites, perhaps even topping his 2016 #americanflowersweek post, is from Flower Farmer Dennis Westphall of Jello Mold Farm, aka @mister.mold. His post and many others caught the attention of Janet Eastman of The Oregonian while she was reporting her story shown above -- and she posted a follow-up on July 3rd to share with her readers. In the coming weeks, we'll recap a full gallery of #americanflowersweek Instagram goodies, but for now, check out Janet's fav picks in her gallery titled "Funny people with 4th of July pride pose with American-grown flowers"! 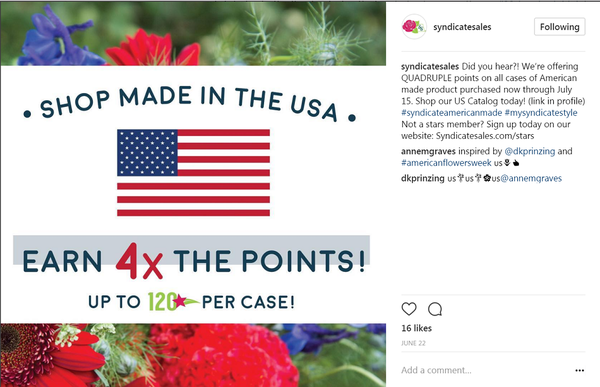 Longfield Gardens' #AmericanFlowersWeek photo contest awarded two lucky winners each a $100 gift certificate -- we loved seeing the participation and hashtagging, of course! 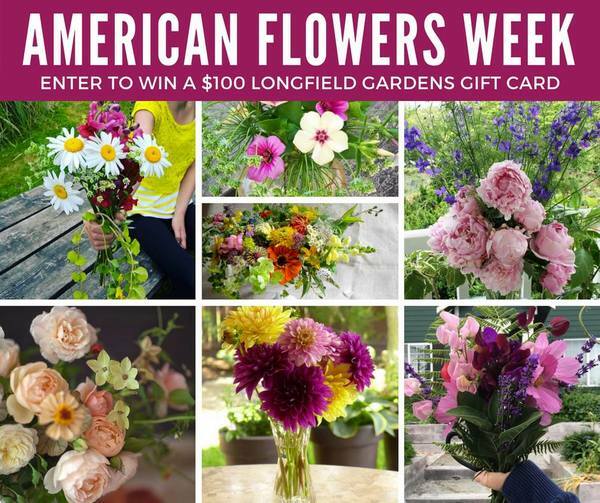 To enter the contest, participants were asked to make a flower arrangement using their own home-grown flowers, take a photo and post it on social media in the days leading up to July 4th -- using the hashtags #AmericanFlowersWeek and #LongfieldGardens. We're so excited to showcase American-grown flowers in American-made vases from Syndicate Sales! 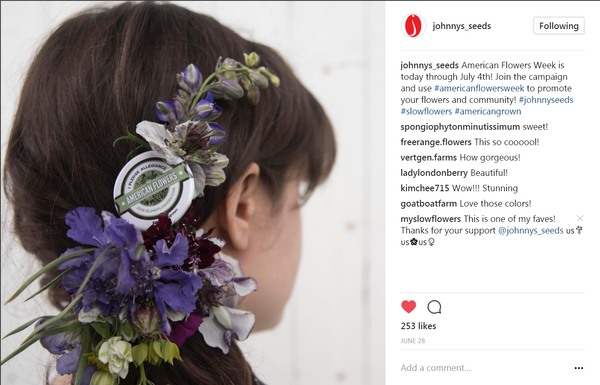 Johnny's Selected Seeds had multiple American Flowers Week posts in support of planting flower seeds, gardening and designing with locally-grown flowers. We loved this creative use of the "I Pledge Allegiance to American Grown Flowers" pin! "I know you are super busy now but I’m so excited about this, I just had to share it with you. Below is a draft of the custom seed packet our graphic designer, Heidi McCausland created. I’m so pleased with how lovely it is it. It’s a small thing but it’s a lot of fun for us to work on these special projects. Thanks for the beautiful images!" 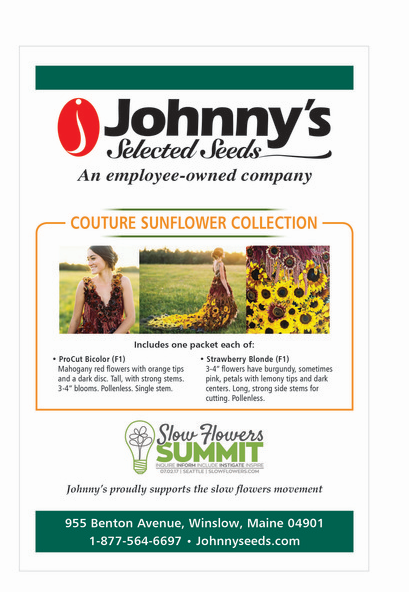 The couture sunflower seed packets were a HUGE hit with attendees of the Slow Flowers Summit -- and thank YOU for your creativity, Johnny's Seeds! 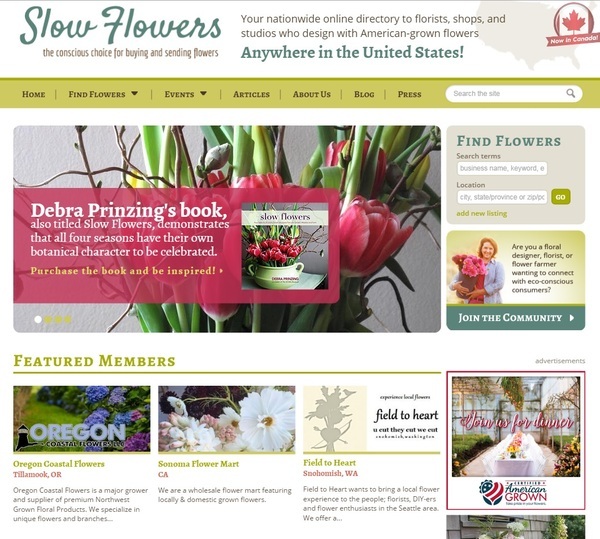 Thanks to our Slowflowers.com sponsors -- especially for your support of #americanflowersweek and the Slow Flowers Summit! Attendees to the Summit took home this beautiful and generous collection of Swag! Seattle Wholesale Growers Market: Hundreds and Hundreds of stems of locally-grown PNW flowers and foliages for our flower wall and decor. Sunday, August 6, 8:30-9:30 a.m.
"Tribe-Building 101: The Power of Community," with Debra Prinzing of Slowflowers.com and Nan Sterman of A Growing Passion. Conference Registration and more details here. 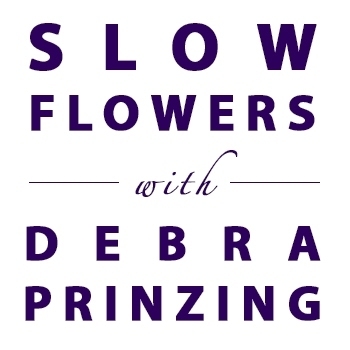 SLOW FLOWERS MEET-UP with Debra Prinzing, co-hosted by Rebecca De Oliveira of Blush and Bloom Flower School. Tuesday, September 12, 9-10 a.m.
Debra Prinzing presents "Slow Flowers" as part of this fabulous 2-day symposium about edibles, ornamentals and floral design. Details and registration here. I'm honored to join Holly Heider Chapple of HOPE Flower Farm for her second annual Flowerstock Experience! I'll be leading creative writing exercises for attendees, guiding as everyone begins to transcribe a personal floral narrative. Details and registration here. We welcomed 15 new members to Slowflowers.com in June! Check them out and be sure to say hello!